Have you ever dreamt of being inside a bubble? or how about putting a friend in one? Now you can make that dream come true! The Mega Loop from Uncle Bubble is well-loved by children and adults of all ages. You just can't help but smile when you're inside a bubble! 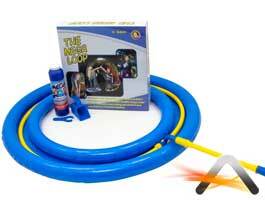 The Mega Loop comes with a giant bubble wand (big enough to put a person inside) as well as inflatable dipping tray and a bottle of incredible Uncle Bubble concentrate formula in a 1:3 ratio. Bubbleologists can also use the Mega Loop to create giant bubble doughnuts and sausages - you can even try chopping them up in to smaller shapes and then force them back together to create funny bubble sculptures!